Uglyworld #293 - What Is Babo Up To (13/365), originally uploaded by www.bazpics.com. I was just starting to fall asleep again when the phone in the hotel room rang - it was the night security guard from the reception asking if I could please come downstairs. I was a little groggy but agreed and after throwing on some clothes I jumped in the lift and went downstairs. 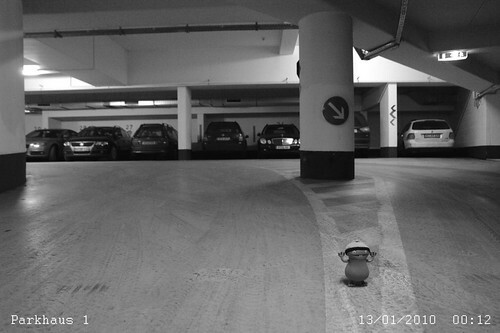 What awaited me I had no idea, the security guard ushered me into the control room where he brought up a still image from their surveillance system - I couldn't believe what was in front of me - Babo wandering towards the exit of the carpark.